Rony Sircar and our own Sponsorship Director Mr. Panuel Baroi sat down and wrote this piece for us. It’s a great blessing to see how much we can change lives, and just shows the small things that we do today, can affect someone for a lifetime. “I was brought to the KMMS Orphanage school in 1996 in grade three from a very poor and broken family of Bangladesh in order to gain a better life with regular food to eat and an education. My world was turned upside down in the best way when I became one of the hundreds of children sponsored by BHCS (Bangla Hope). I had been living with my Uncle. We didn’t have proper meals, not even the most basic amenities. We were very poor. There were five children including me and it became very difficult for my Uncle to send me to school and nurture us. Then Bangla Hope came into my life. 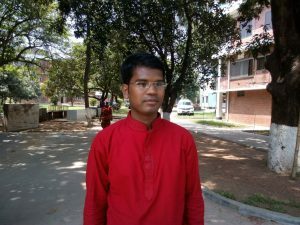 I started going to school in Bangladesh because of Bangla Hope. I could learn new things, see the world and meet new people in a new environment at KMMS orphanage. I never experienced the love and affection of a family until I was at Bangla Hope. Looking back, I could not see any hope in my life before Bangla Hope. Now I understood its happened and only possible by the help of God through Bangla Hope Organization. I had a terrible eye accident in my childhood and I am blind in one eye, but I give thanks to God for being with me. I have finished my High school and college from BBA Department of BASC and have also achieved government degree. This is only possible with my sponsors help. I am thankful to the Bangla Hope organization and my Sponsor who constantly extend their helping hand toward me. Now I am serving Union Mission of SDA Church since 2015. Now I can see uncountable blessings and grace as my life blooms.